It's all about you. Booking your DJ should be an exciting, fun and easy experience. We are not sales people. We don't assign you random people to DJ your wedding. We meet with you, we listen to your needs, and we guide you through every step of the way to ensure your wedding is amazing. We are all about creating awesome! This is not a birthday party, your wedding celebration only happens once. There are no second chances and we understand that. Hire a DJ you trust. One that can handle the intricate details and needs of your wedding. This is not some side gig for us, we or seasoned PROs! We do it week in and week out... and we LOVE IT! We are not sales people we are Entertainers we let our work speak for its self! Let’s talk about all the planning that goes into your special day! 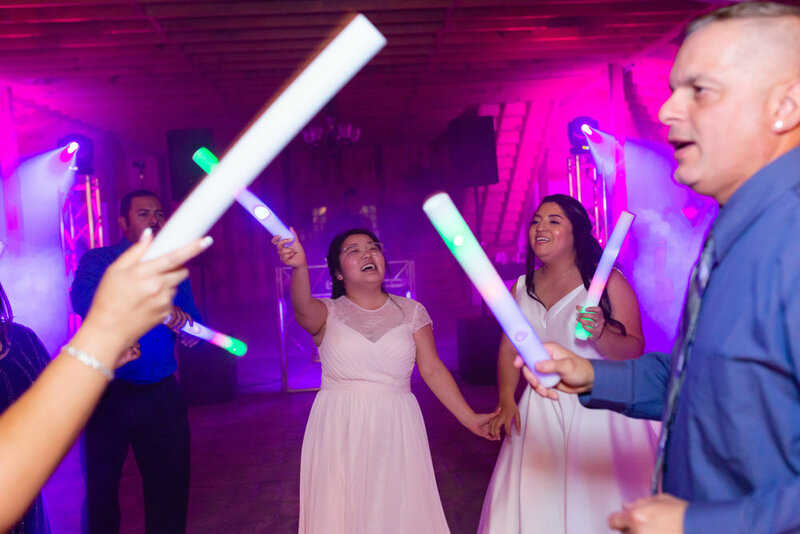 Throughout the years of experience and research, we have found that most people remember the interactions and fun they had during there wedding! In fact, read this article from wedding vibe on the importance of your wedding DJ! We are more than just a DJ at your wedding. We are Entertainers! Similar to how you are a host at your house, the entertainer of your choice will be up greeting / helping guests, coordinating with other vendors, and making sure your big day goes off without a hitch! Computer controlled Lighting NOT spin and puke lighting! Most DJs use what is called sound active lighting, aka lights that do random flashes/strobes, dots, and colors. Our lighting is software controlled and does only what we program it to do! Mobile Wedding Planning App! No website login, no remembering your password, just open the app! Our exclusive FSL wedding planning app works on Android or Apple devices and lets you plan your wedding, listen and choice music, and create your timeline! Contact us via our website, e-mail, text, or call. Check availability, pricing, and to schedule a consultation. Schedule a consultation with us to discuss your celebration, pricing, and to see if we are the right fit! Let us know you're ready to move forward! To secure the date a signed contract and a $300 deposit is required. During the planning phase we are here to help you for every step of the way. Use our mobile planning app to begin planning your celebration (choose your music and create a timeline of events). We will meet 3-4 weeks before the event to finalize every single detail of your celebration together. We will go over your music selection, event festivities, and timeline of events. Watch as your vision finally comes to life! Sit back, relax, and enjoy your special day with family & friends! Ceremony is the most important part of your whole day. We make sure you have crystal clear audio and music during the whole ceremony. Turn any venue into the most beautiful reception room ever. We can do this through unique, venue specific, up-lighting. Most companies just put out 10 lights and set the color. We do site inspections prior to the day of your wedding and design a lighting solution that will highlight and enhance the room. Want to add that wow factor and branding element to your wedding? We can do static monograms in either black and white or full color. We can do the classic bride and groom names on the wall, above the head table, or even on the dance floor. Going for that rustic look that’s super popular right now? We offer glass string bulb lighting that looks amazing outside, in a tent, or a barn. We have a full staff that will handle putting up the lights as well as taking them down. Saving you hours of hassle.